Meeting in Ottawa – Come early, stay late! 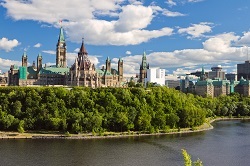 Centrally located with excellent air and transportation links, Ottawa is a premier Canadian meeting and convention destination any time of the year. It is an impressive yet intimate G8 capital, home to famous landmarks, cultural attractions and celebrations, rich in natural beauty and blessed with a relaxed urban rhythm. Adding unique Ottawa activities for delegates to your agenda is easy and very flexible based on the season. Delegates themselves tend to arrive here early, stay after their event, and bring along their spouses to enjoy everything Canada’s Capital has to offer – helping your event attract more delegates in the process. And the Shaw Centre will be at the heart of it all – within easy walking distance of major downtown attractions and landmarks, the ByWard Market, restaurants, and shopping, yet just a 20-minute shuttle ride from the Ottawa International Airport. Find out what’s happening in Ottawa during your visit, or to plan your next visit by checking out Ottawa Tourism or the Ottawa Tourism event calendar. Enjoy your visit to Ottawa!